We hope to use this page to keep members updated on each other and on the latest happenings within the organization. "The World of George Washington"
The Harry S. Truman Chapter and Color Guard participated in a SAR Member Grave Marker Dedication for Compatriot Herbert F. Simon at Forest Hill Cemetery, on Saturday, October 10, 2009. 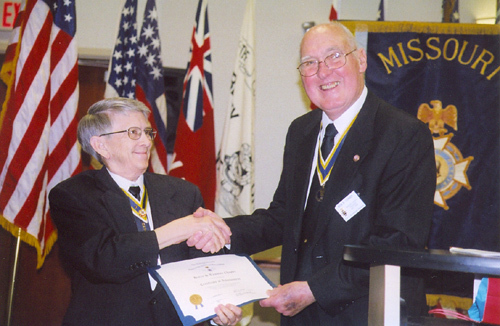 Compatriot Simon was an active member and past Genealogist, Vice-President, and President of the Harry S. Truman Chapter of the Missouri Society, Sons of the American Revolution, and MOSSAR Genealogist from 1996-2000. Compatriot Larry Loker offered a tribute to Compatriot Simon. 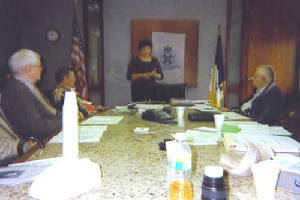 The members of the Harry S. Truman Chapter are shown here listening to guest seakser Carolyn Grover at the October 2009 meeting. Her topic was on the Orphan Train. She stated that between 1854 and 1929 an estimated 200,000 orphaned, abandoned, and homeless children were placed out during, what is known today as, the Orphan Train Movement. The members of the Harry S. Truman Chapter and Color Gaurd are shown here at the 25th Birthday Celebration on August 8th, 2009. The Charter date for the Chapter originatated on August 4th, 1984. Compatriot George DeLapp and Robert L. Grover, are both founding charter members. The original charter and 25th Year proclamation signed by Independence, MO Mayor Don Reimal were also on display. 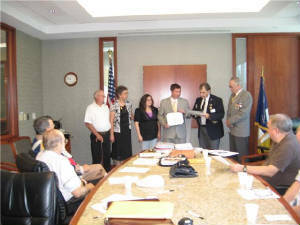 President Dirk A. Stapleton, Harry S. Truman Chapter, is shown here presenting a reaffirmation oath to Compatriot Nicholas D. Large at the August 8th, 2009 meeting. 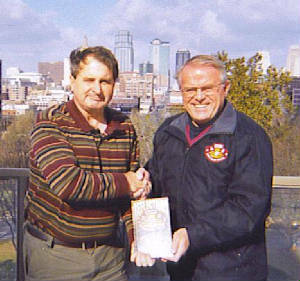 Compatriot Nicholas D. Large is the newest member of the Harry S. Truman Chapter, in which he is shown here receiving his Membership certificate. 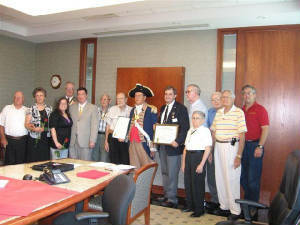 Charles Hougland; Judith Hoagland; Kristen E. Strend; and Compatriot Romie Carr; also participated in the ceremony. The Harry S. Truman Chapter celebrated their Fourth of July Luncheon early this year on June 27, 2009, at the John Knox Village in Lee's Summit MO on Saturday, June 27, 2009. In attendance included special guest speaker Mary Lynn Tolle, Honorary State Regent, Missouri and Vice President General NSDAR. Several D.A.R. 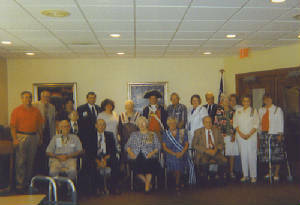 members from several local D.A.R. Chapters also attended. Guest speaker Mary Lynn Tolle received the SAR Medal of Appreciation from Compatriot Romie Carr and Vice President General of NSSAR - South Central District, Robert L. Grover. 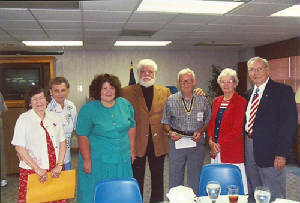 As the guest speaker, Mr. Reuben Siverling spoke at the Harry S. Truman Chapter Meeting on September 13, 2008. His topic was on his first-hand experiences in Vietnam along with combat stories while assigned to the 4th Infantry Division Long Range Patrol/Company K 75th Infantry Airborne Rangers. In addition, he discussed his book titled "Reflections: True Vietnam Combat Stories as Shared by the Elite LRRPS, LRPS, and Rangers of the 4th Infantry Division". In this 220-page book, Mr. Siverling has written and compiled from recollections submitted by members of this Ranger unit. Mr. Reuben Siverling is a Senior Vice President of Commercial Lending for the Northland branches of First Community Bank in Kansas City. 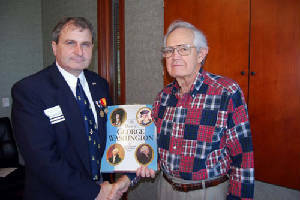 The Harry S. Truman Chapter has donated his autographed book to the National Society of the Sons of the American Revolution (NSSAR) Historical and Genealogical Research Library in Louisville, KY.
in Independence, MO. on July 12, 2008. Mayor Reimal provided a great insight to current issues being faced by local council members and taxpayers of Independence, MO, and the future of the city. His topics included Capital Improvements, the local School District, 353 Program, Enhanced Enterprise Zone, Little Blue Expressway, Jackson Drive, Bass Pro, Arena, Court House on the Square, Genealogical Center, Sports Complex, a new HighS chool, St. Mary's High School, Police Training & Driving, Training for KCATA Bus Drivers, and Fire Training. (L-R) William Hartman and MOSSAR President Bob Commer. At the 118th Annual MOSSAR Conference, in Independence, MO on April 25-26th, 2008 Harry S. Truman Chapter President William Hartman is shown here receiving a Certificate of Appreciation for his efforts from MOSSAR President Bob Comer. (L-R) Compatriot Risley & Carr and Colonel Greg Champagne. 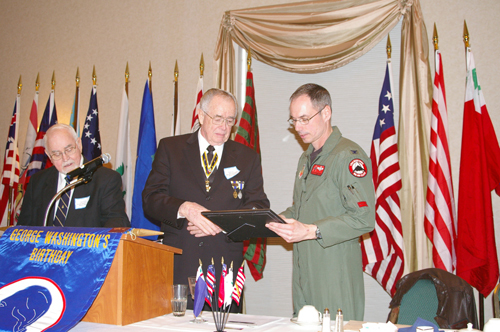 Pictured here is the guest speaker during the 22nd Annual George Washington Birthday Celebration, on February 23rd, 2008, Colonel Greg Champagne, Vice Commander, 131st Fighter Wing, Missouri Air National Guard, St Louis. Colonel Champagne presented a program on the Air Force's premier weapon system, the B-2 bomber. 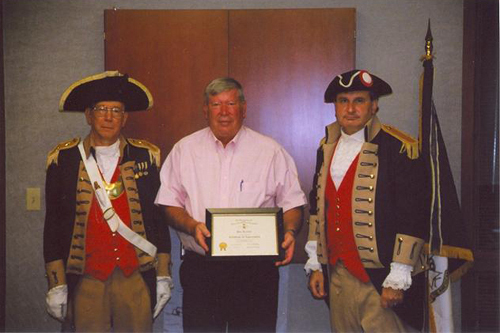 Colonel Champagne is also shown here receiving a Certificate of Appreciation, to be presented to the men and women of our fighting force at Whiteman AFB, MO from Compatriot Romie Carr, Chairman of the George Washington Birthday Celebration Committee. 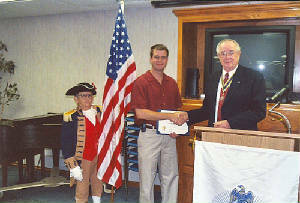 At the July 8th, 2006 meeting, Justin Scott Bush is shown here being welcomed as a new member. President Romie Carr and William Hartman are presenting the Membership Certificate to him. 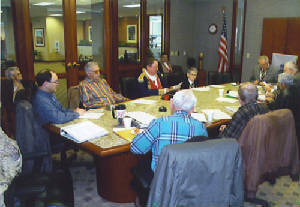 At the July 8th, 2006 Meeting, several members and their spouses attended the SAR-DAR meeting. DAR members present from the Blue River Chapter were Betty Hartman, Jo Lynn Hartman, Sherry Hartman, Dixie Young, Joan Mickelberry and Shirley McCann was from the Marguerite McNair Chapter of the DAR. Laura H. Truman from the Independence Pioneers Chapter and Lois Walden, from the Prairie Chapter of the DAR. Several guests included Carolyn Carr, Gerry Duncan, Anita Taylor, and Hugh Young. On May 29th, 2006 Compatriots Robert Grover and James Scott participated in the Liberty Memorial Day Parade and Memorial Service. 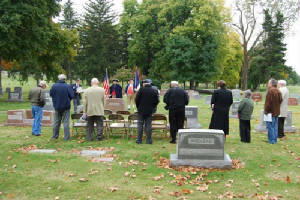 Later, they also participated in the Independence, Missouri Parade and Memorial Service at Woodlawn Cemetery. On April 29th, 2006 State Officers installed at the MOSSAR State Meeting from our chapter were William Hartman, Courtney Sloan, Treasurer; James Scott, Sergeant at Arms; and David McCann, State Genealogist. Congratulations gentlemen! Also at the MOSSAR State Meeting, our nominee for State Teacher of the year, Mr. Peck was awarded the honor at the MOSSAR meeting. In addition, Carolyn Grover, wife of Robert L. Grover, was chosen as Woman of the Year. Congratulations to the both of them as well! Today the SAR consists of 26,000 members in over 500 chapters in the United States, Canada, France, Germany, Switzerland, and the United Kingdom. Almost 165,000 descendants of the men and women Patriots of the American Revolution have been admitted since our founding. SAR members include fifteen presidents of the United States, Brigadier, Lieutenant and five star generals, presidents of several colleges and universities, ambassadors, and members of the Supreme Court, the U.S. Senate, and the U.S. Congress. Members include small businessmen, doctors, lawyers, school teachers, CPAs, elected local, state, and federal officials, and government employees, all of whom have a deep affection for America its heritage and institutions. SAR members answered their country's call in every major American conflict beginning with the battle of Lexington and Concord on April 19, 1775 up to the present, including Operation Desert Storm, Bosnia and the current actions in Afghanistan and Iraq. SAR members have received the highest awards America can bestow, including the Medal of Honor. Also at the MOSSAR State Meeting on April 29th, Courtney Sloan received the Meritorious Service Award from the chapter. He has already won this order before, so he did not get a medal this time. Compatriot George L. DeLapp received a supplemental for Prince Sherman. In addition, on 05/12/2006 George also received a new grandson. Jim Mickelberry, Sr. received a supplemental for William Grever. Romie Carr has received two supplementals, one for Thomas Townsend and one for Edward Wade, Sr.
On April 4th, Compatriot Grover attended Election Day, Voting in uniform. On February 24, Compatriot Grover attended the Leadership Meeting in Louisville, KY.
Let us know if there are any events or updates you would like to share with fellow members. Copyright © 2006 MOSSAR All Rights Reserved.